"On the right side, near the bottom, a sheaf of wheat, and on the left a bundle of seventeen arrows, both standing erect; in the background, and rising above the sheaf and arrows, a mountain, over which shall appear a rising sun. The state seal to be surrounded by these words: 'The Great Seal of the State of Ohio.' "
The engraver who cut the seal departed slightly from the letter of the law. In place of a mountain he made three; and he also placed a river flowing along the base of the range. The state capital was then Chillicothe, and it is a local tradition there that he used the outline of Mount Logan, which stands east of the city, for the central peak, and the depicted river represented the Scioto River, which washes the base of the hill. This view is also seen from Thomas Worthington's (6th Governor of the state) home, Adena. This story is very probably correct. The coat-of-arms of the State of Ohio shall consist of the following device: A shield, upon which shall be engraved on the left in the foreground, a bundle of seventeen arrows; to the right of the arrows, a sheaf of wheat, both standing erect; in the background, and rising above the sheaf and arrows, a range of mountains, over which shall appear a rising sun; between the base of the mountains and the arrows and the sheaf, in the left foreground, a river shall be represented flowing toward the right foreground. At the bottom of the shield there shall be a motto, in these words: "Imperium in imperio." It will be seen that the design really followed the old Chillicothe engraver's idea, in the points in which he did not follow exactly the law of 1803. The only really new thing was the addition of the motto. When its meaning "An empire within an empire" was fully understood, there was a great deal of objection. It savored of the old southern state rights doctrine, which was one of the dogmas settled adversely by the Civil War, then just over. "That the coat-of-arms of the State of Ohio shall consist of the following device: A shield, in form of a circle. On it, in the foreground, on the right, a sheaf of wheat; on the left, a bundle of seventeen arrows, both standing erect; in the background, and rising above the sheaf and arrows, a mountain range, over which shall appear a rising sun." This simply restored the original design of 1803, except that it used the phrase "a range of mountains" instead of "a mountain." In engraving the seal, however, the river was left in, although not mentioned in the act, as will be seen by the cut. Ohio was the seventeenth state admitted to the Union, therefore the bundle of seventeen arrows typifies the American Union; the sheaf of wheat is symbolic of agriculture, the state's original and still most important industry. The rising sun is an allusion to the advance of the state in wealth and power. The mountains are an allusion to the fact that this was the first state west of "the mountains"—that is, the Alleghanies. Though not authorized, the river is altogether appropriate, it represents the Ohio river, from which the state was named and an important part of Ohio's early development. In an attempt to reign in the design of the seal, the Legislature officially adopted Ohio's modern version in 1967, modifying it again in 1996. The Scioto River flows across the center of the seal, separating cultivated fields from Mount Logan. 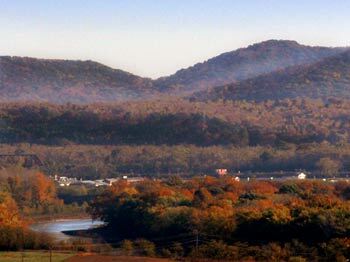 Thirteen rays of a rising sun radiate over the mountain, symbolizing the 13 original colonies. In the foreground stands a sheaf of wheat, representing agriculture and bounty. Mimicking the sheaf of wheat is a bundle of 17 arrows, symbolizing Ohio as the 17th state to join the Union. The crown jewel in the Rotunda's dome is its 29-foot-wide skylight. The center circle of the skylight is a hand-painted Great Seal of Ohio, a reproduction of the Seal that was in use in 1861 when the Rotunda was completed. This version of the Seal is similar to Ohio's present seal, but features a canal boat that is totally missing from today's seal.